For the Integra women, most of whom are young mothers, living in traditional family set up that is typical in any Tier-2 city of India, it was felt that a session to encourage them and tell them that it is OK to want to have a career as well as a family life was required. In addition, it was felt that some awareness on how handling issues at work differs from handling issues at home would help them to be better professionals. 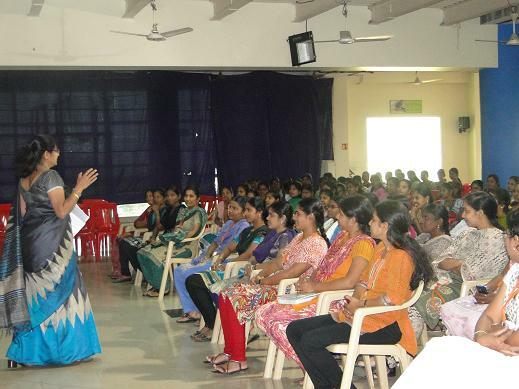 In order to help them cope with work life balance, and also bring certain professionalism into work place, eWIT felt that Kalyani Narayanan, who is the CEO of www.easyinsuranceindia.com, who hails from one such typical family set up, would be able to better identify and share her experience and learning with this group. The way we manage our time, communication, and self differ very much at home and at work. More than 250 women attended this 90 minute session. The feedback received from Integra on this session is shared elsewhere here.